In the area between the Hauroko Burn and the Hay River in Southern Fiordland potassic granite was found to have intruded metasediments with probable megaxenoliths of diorite sheets and part of a layered basic intrusion (probably related to the Mt George Metagabbro). The area has later been intruded by dioritic, mafic (probably andesitic) and felsic dykes and faulted, uplifted and eroded. Petrographical work enabled the diorite sheets to be subdivided on the basis of their zircon content. Coronas of orthopyroxene and amphibole were noted on olivine - plagioclase I l boundaries in the layered basic intrusives implying a protracted period of high temperature conditions after their intrusion. Some uralitisation was also noted in these rocks and attributed to alteration caused by the intrusion of the granite. Geochemical analyses suggest a tholeiitic affinity for the basic intrusives and also indicate that it is unlikely that the dioritic sheets are related to the basic intrusives. The granite is shown to have S - type geochemical and petrographical characteristics but I - type field characteristics. Structure is simple with an approximately north-east - south-west trending fault system and a few north - south striking faults. 94 leaves : illus., (part col.), map (col. in pocket) ; 30 cm. 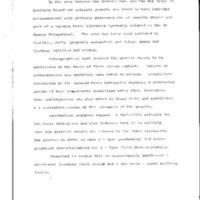 Brodie, Colin Geoffrey, 1957-, “Geology of an area between the Hauroko Burn and the Hay River, southern Fiordland.,” Otago Geology Theses, accessed April 22, 2019, http://theses.otagogeology.org.nz/items/show/117.